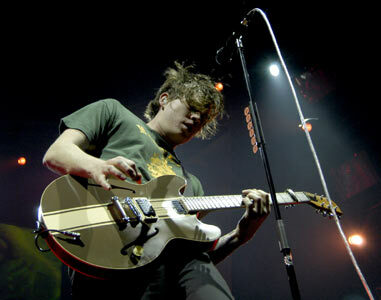 In this photo, Jones is seen playing ES-339 with Dunlop Tortex picks visible attached to the mic. In this photo of John Frusciante singing into the mic, his Dunlop Tortex 0.60mm guitar pick can be seen in the microphone stand pick holder. This is a shot from the recorded Red Hot Chili Peppers performance *Live at Slane Castle* (recorded August 23, 2003 at Slane Castle grounds). 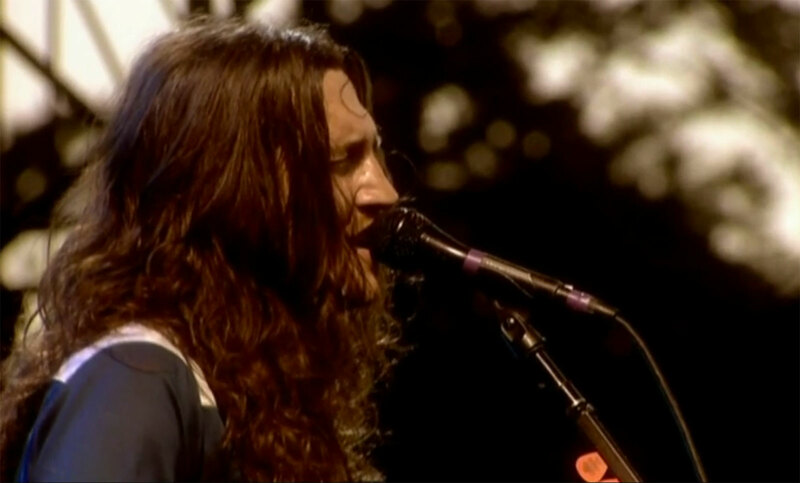 The 5th track into this performance has Frusciante [performing a solo cover of the song "Maybe"](https://www.youtube.com/watch?v=u0jm4snDOkk) by The Chantels. 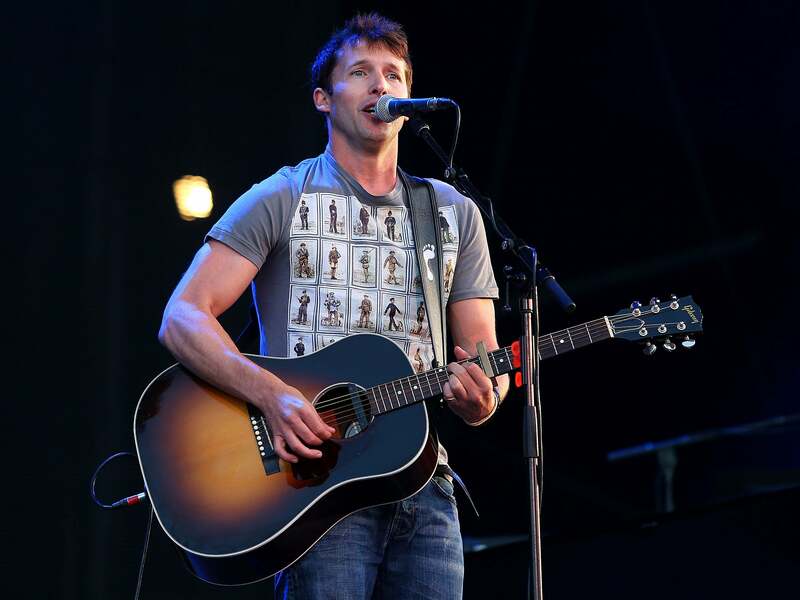 As he is singing, the camera slowly zooms into his side, and the picks wedged in the mic stand pick holder come into view (around 1:15 into the song). Judging by their distinctive color and layout of the graphics on the pick, they can be identified as the .60mm versions of the Dunlop Tortex. 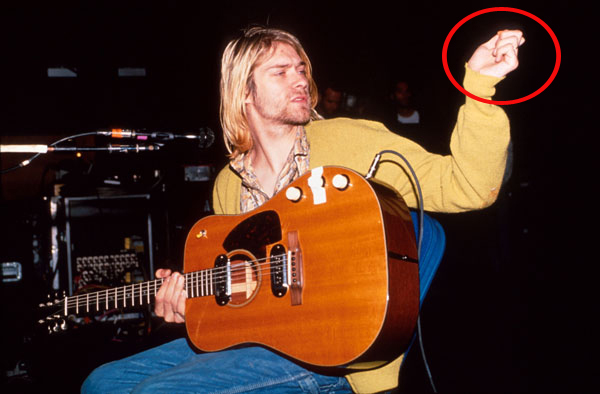 He has several of these wedged in the holder, meaning he uses them throughout the performance. The DVD of the entire Red Hot Chili Peppers - Live at Slane Castle performance can be found [on Amazon](http://www.amazon.com/Red-Hot-Chili-Peppers-Castle/dp/B0000DZEE3). In this Rig Rundown with Omar Rodriguez-López, he talks about the picks he use, Dunlop 0.60 picks that he has used since he was a kid. He says they are right in between thick and thin. "Tortex .60s picks. Again, that's what he's always used. I think John [Frusciante] used the same thing," says Josh Klinghoffer's guitar tech. According to Premier Guitar's article, Santiago uses Dunlop Tortex .60mm guitar picks. At 9:08 of the video "Paul Banks - Full Performance (Live on KEXP)" you can see a close-up of the Dunlop Tortex pick wedged in the pickguard. This article (originally sourced from Bass Player, but seemingly no longer in existence online) states that when Flea needs a pick to play a song such as Parallel Universe, he uses Dunlop Tortex .60mm. "I've been using lighter picks for the last few years. They sound better overall and the pick-scratches are way better. My favourites are the orange .60mm Tortex brand. I love the tone and the feel." According to Premier Guitar's rig rundown, KT Tunstall uses orange Dunlop Tortex .60mm guitar picks. Tom uses Dunlop Tortex .60mm picks. According to this ad from Dunlop, Dave uses Dunlop Tortex Standard Guitar Picks, 0.60mm. In this photo, Joy's picks are visible, which are Dunlop Tortex 0.60mm picks when zoomed in. 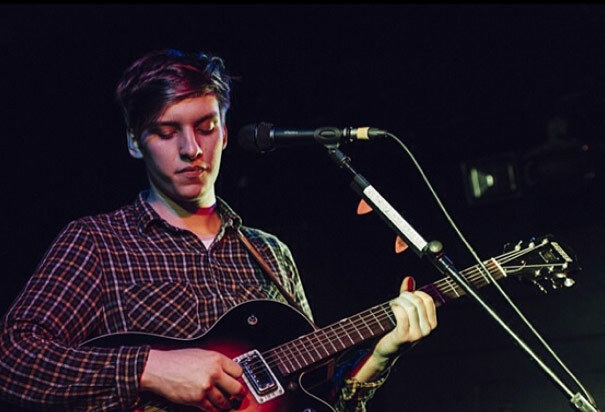 In this photo, George Ezra can be seen with Dunlop Tortex 0.60mm picks. Most likely the picks he uses for most of his shows, when zoomed in this photo, you can see Tortex graphics. Also seen in a lot of different photos. Yep, for sur Dunlop Picks ! 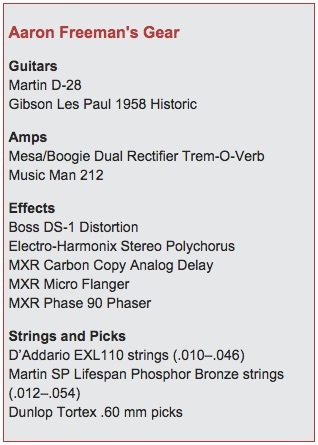 According to Guitar Geek's rig diagram, Blair uses Dunlop .60mm Tortex picks. In this photo from Shoreline Amphitheater concert, we can see couple of Dunlop Tortex picks attached to the mic stand. This image is from their official web store. According to Premier Guitar's interview, Kaplan uses those picks. At 4:14 he explains that his signature picks that he uses are the exact same as the regular .60mm tortex picks by dunlop. According to the Premier Guitar interview, Knudson uses the Dunlop Tortex 0.60 mm guitar picks. Lars is often seen using this pick. Visible in this photo on Miller's mic stand. *Premier Guitar* finishes out their [list](http://www.premierguitar.com/articles/21257-aaron-freeman-return-to-form?page=3) of gear Aaron uses with his Dunlop Tortex .60 mm picks. around 11:03, a bag of Tortex guitar picks can be seen on the Korg Microsampler. According to Premier Guitar interview, Romweber uses the Dunlop Tortex 0.6mm guitar picks. At 1:24 minute mark, we can see Dunlop Tortex 0.6 mm picks attached to Staveley-Taylor's microphone. Asked by an interviewer, "What type of pick do you use and why?" Colin Newman of [Colin Newman & Corrado Izzo](http://equipboard.com/band/colin-newman-corrado-izzo), [Wire](http://equipboard.com/band/wire), [Githead](http://equipboard.com/band/githead), and [Spigel*Newman*Colin*Malka](http://equipboard.com/band/spigel-newman-colin-malka) replies, "I’ve used Jim Dunlop .60 nylon picks since forever and ever." Taken from this [interview](http://www.silbermedia.com/qrd/archives/41ColinNewman.html). According to Premier Guitar, Baizley uses those guitar picks. In this photo, Feerick can be seen holding the Dunlop Tortex 0.60 mm picks with his teeth. At 20:05 you can see the orange pick wedged into the pickguard. Calvin is listed as using thing Dunlop picks in this Premier Guitar article. At 1:40 and other occasions you can see Stevie with one of these picks. "I use the .60mm & 1.0 Picks", can also be seen on his [instagram](https://www.instagram.com/p/BO8mD8BAyJS/?taken-by=jonkuenning) account. Visible on Pelle's piano in this Instagram post. Since 2006 Luke Weiler of Positive Mental Trip has only used Dunlop Tortex 0.60mm picks as his go to. There are times when he has used the Dunlop 44 P 73 and 88 nylon standard picks with the grip when only playing lead guitar or on a song for just the lead guitar parts. However when luke is playing live and when he has the choice he prefers the Tortex orange 0.60 mm as he enjoys playing rhythm with them and breaking less strings. He also loves how they are just thick enough pretty much perfect thickness to get energetic for 8 hours at a time playing rhythm and lead guitar and not break strings. When jumping up and down during shows he found he was breaking more strings with the grey grip 88 and 73 nylon picks. Still whatever he goes with for any specific reason it is always Dunlop. And 95 % of the tortex Standard 0.60mm. The picks can be seen on Karina’s microphone stand with a Dunlop pick holder. Karina is the one recording this video. No other size but the 0.6mm Dunlop pick actually appears. These picks will vanish, then appear inthe oddest places. When I started playing, they kind of just appeared on my desk, and now I just find them in strange places. Luckily, I have an Altoid tin to keep'em safe, now. OK, I've used these picks for a long time, but I've used plenty of others. The 0.5, I just got, and so far, they might beat the 0.6. I've also tried those Snarling Dog Brain picks, but that grip is awkward. I find that my picks move a lot on my finger, and I like it. But otherwise, these Dunlop picks have been the absolute standard for myself. 0.6mm is a somewhat good balance between thin and thick, but my preference seems to be leaning towards a lighter size. I give it four stars because there are better picks, and as of now, I can't say they are the best until I've tried much more. Not much to say really as it is only a guitar pick! It is in between being soft and hard making it a great all rounder! This guitar pick has been my perfect choice. My first picks, and picks that I use to this day. Absolute grip and good both for strumming and playing solos. Best picks Dunlop has ever made for any kind of rock and other genres except metal. Great feel and touch on the instrument, what's there to say?! only downside is that logo rubs off after a while. My favourite pick, comfortable to hold, good for strumming and picking would recommend to anyone. WHY does a pick even matter so much? but Jesus, everybody, these are perf. it's a pick that you just keep looking for when you want to play your favourite song. very flexible, and feels and sounds great! I really like these picks for acoustic guitars. They aren't too thick for a harsh attack, and not too thin and flimsy in the hand. Durable...long lasting...easy to hold onto...great pick scrapes on the strings. I love this picks so much the are without a doubt the best. My go to pick, very versatile and my favored gauge out of all of Dunlops line. I spent years playing with yellow dunlops. I transition regularly between bass and guitar and found myself breaking strings when I would switch to the guitar. I dropped down to this gauge and have since found a truly comfortable and utilitarian playing style with them. They have enough girth to give me strong attack on my guitar, but also have enough malleability to not break my strings or to let me be quick. I have found they're just thick enough to play bass with as well, although I do tend to shred them when I use them on bass. I play lots of bass chords, arpeggios, and guitar-like lines on the bass so my choice of pick has changed over the years. For the sake consistency, these picks do the job just fine, and happen to excel at various picking styles for guitar playing as well. Orange is my least favorite color, but orange dunlops are certainly my most favored pick. They are my go-to picks, and at some point I ordered them on-line in the color black. Firme, leve e duradoura. Com uma cor chamativa que facilita ser achada. Not my go-to choice, but still cool. They do work well as acoustic picks and they work for sticking into the pickguard. It works fine when I strum Horse With No Name but when I try to play Surfing With The Alien, it sounds totally rubbish; all the notes come out at the wrong speed and the wrong order.. I've got all the best guitar and amps and stuff except for this pick, so it must be the pick, right? What's the bestest, most expensivist pick I can get? Perhaps I should try a plectrum instead?